As a subconsultant to Westech, Bennett Trenchless Engineers provided design assistance and construction inspection services for the Netarts Force Main Replacement Project. 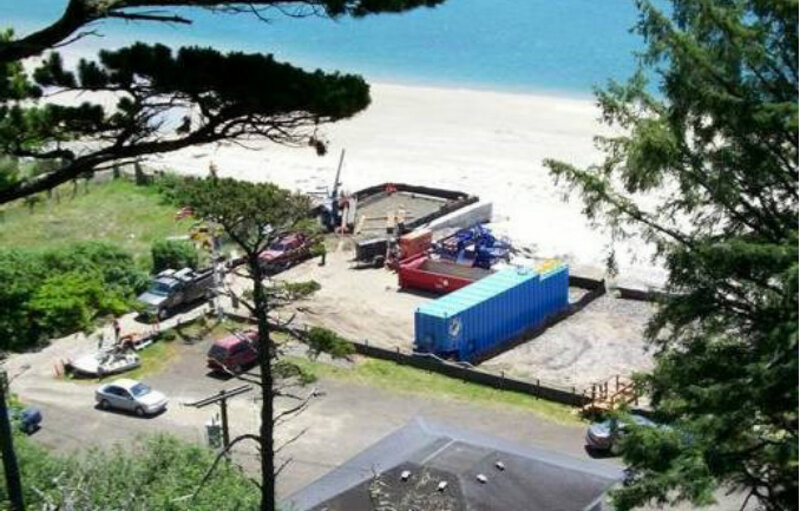 The Netarts Oceanside Sanitary District on the Pacific coast near Tillamook, OR had only one sewer force main pipeline that ran along the beach and up a 120-foot high bluff through landslide deposits and was susceptible to ground movements. The District elected to replace the sewer, using HDD to install 1,386 feet of 11-inch inner diameter DR 9 HDPE sewer away from the beach and beneath the landslide deposits. Four borings completed along the alignment encountered clay, silt, sand, gravel, cobbles, wood, and embankment fill, providing serious challenges. A conductor casing was used to bridge and support the near-surface gravels and cobbles along the beach. However, gravels and cobbles were also encountered within the bluff, and random roadway fill was anticipated near the exit. Therefore, an alternative exit was developed if the bore could not be completed through the fill. Bennett Trenchless Engineers designed the HDD crossing, provided geotechnical evaluations, and provided trenchless specifications and drawings. Bennett Trenchless Engineers also provided full time on-site inspection for the horizontal directional drilling. Design issues included selecting a profile to avoid excessive gravels and cobbles, minimizing disruption while working on the beach during the tourist season, 120-foot elevation changes between entry and exit, random fill materials at the upper end of the alignment, controlling drilling fluid pressures to prevent hydrofracture, steering control in gravels and cobbles, and pipe layout along the highway. The project was successfully completed within budget and schedule with no claims or over runs.